The YardMax is the newest fence from PetSafe. This system takes the best features from all other PetSafe systems and adds a few new features. The YardMax system boasts one of the most compact and lightweight collars on the market, yet still manages one of the highest maximum correction settings as well as individual correction levels for each collar on the system, so its a great choice for most breeds and an equally good choice for single and multi-dog households. The YardMax collar is compatible with all 3 PetSafe Pawz Away indoor and outdoor barriers. The most exciting new feature is the system's namesake - the YardMax space-saving technology. In YardMax mode, the correction zone extends infinitely on the outside of your boundary wire to maximize yard space while making it more difficult for your dog to run through. Our PRO-Grade System adds professional-grade burial wire, dual function surge protector, ground staples, and an extended warranty. Small & Lightweight: The PetSafe YardMax collar uses a very small collar. 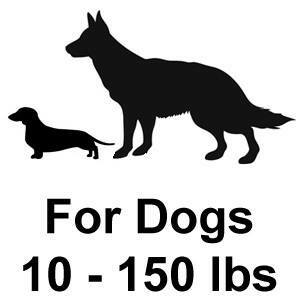 Suitable for dogs as little as 10 lbs., the entire collar weighs only 3 oz. This collar is almost as tiny as the PetSafe Elite Little Dog PRO-Grade, but doesn't have quite as low correction levels. Five Progressive Correction Levels: The YardMax offers 5 progressive correction level setting for each dog on the system. The correction levels are adjusted on the collar itself. Despite the small size, the correction levels range from medium to strong - stronger than the PetSafe UltraSmart system but not quite as strong as the Stubborn Dog. Individual Correction: PetSafe has finally developed a system with individual correction level settings so you can effectively use a YardMax collar for each dog over 10 lbs. with its own correction level settings. No more mix & match PetSafe collars! Rechargeable: The collar uses a rechargeable lithium-ion battery. The collar battery is recharged by way of a charging cord that plugs into a port on the underside of the collar. The collar charges in about 2 hours and the charge lasts about a month. Fit Test & Ready Test: A poorly fitted collar is the second most common problem leading to less than 100% containment (incomplete training being the #1 reason). The YardMax collar offers the Fit Test feature. This handy feature confirms that the collar is properly fitted each time you put it on your dog. Short & Long Contact Points: The system comes with both short and long contact points as well as a contact point tool. The small wrench makes switching contact points easier. Long contact points are particularly useful for dogs with thick or long fur. YardMax™ Mode: The most exciting feature of the new PetSafe YardMax is the system's namesake YardMax™ mode. This is the first system ever to offer a unique space-maximizing feature that projects the correction zone only on the outside of the wire rather than in all directions so you can really make the most of your yard space. Run-Through Prevention: The run-through prevention is another unique and really useful feature. Most dog fence systems have a set boundary width so the dog can actually run all the way through the boundary zone to where he is no longer being corrected but will receive a correction again if he tries to re-enter his yard. But in YardMax mode, the correction zone continues indefinitely on the outside of the boundary wire so the dog cannot run all the way through the boundary. For safety, the system still has a 10 second timeout on the correction, but this feature will really help with training. 10 Acre Capacity: The YardMax is capable of powering 10 acres. While this is suitable for most suburban properties, we wish it was strong enough to power larger rural spaces as well. 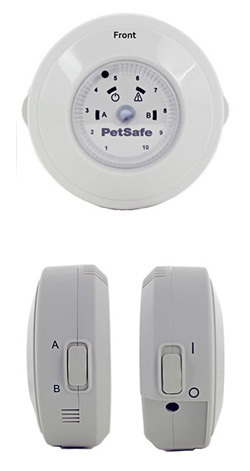 Lacks Backup Battery: This PetSafe system does not offer a battery backup for the transmitter. While this isn't a problem for many of our customers, it is certainly something to consider if you live in an area prone to power outages. The YardMax fence by PetSafe is a very good investment. The system works perfectly. The PetSafe YardMax pro fence is very impressive. I don't think any of the other fences that Flexpetz sells has the same ability for the dog to get right up to the perimeter wire before she gets a signal warning. Most fences like this will start to alarm when the dog gets several feet out from the wire. This fence gives the dog the most amount of yard space to play in, so she doesn't feel cooped up in a tiny space. The staff at Flexpetz helped me with all the questions I had for them, over 2 separate phone calls. I felt very comfortable in my purchase and prepared to get it all setup by myself. Actually, I had help, but I felt as though I could have done the whole task alone. I would give this fence two thumbs up. Great system. I just wish the Yardmax came with a non-rechargeable collar instead. I chose the Yardmax professional fence because I liked the fact that it comes with a much stronger, larger wire coupled with the function of being able to get right up to that wire before getting the zaps. I do not have a large yard at my home and cannot afford to have any of it impeded by the correction area that most of the fence systems put off. The Yardmax professional fence is perfect for my layout, and lhasa. However, I prefer to have a collar with batteries. I'm not a big fan of rechargeable things. They never seem to last as long for me as I feel they should. Maybe Petsafe will make a regular battery operated collar that will work with this fence, but for now -I'll use the rechargeable and hope it lasts a long time. This system is terrific. I am very happy with the investment that I made with this dog fence. Everything ran smoothly with the system and my 3 dogs. I took a Saturday afternoon and installed the dog fence system with my husband. This dog fence allowed us to maximize our entire yard while in YatdMax mode. I now realize that walking the dogs is great for exercise but, now I realize the dogs get 3 times more exercise with the Yardmax dog fence. The YardMax has lived up to it's reputation. Thank you FlexPetz for your assistance in making my life easier with 3 big dogs. I would give this Yardmax Pro fence a high A rating for its price, features, and ease in installing. My only negative thought on this fence setup is that it only works with the one type of collar that it comes with. It seems like all the other Petsafe brand fences are compatible with lots of different fence collars. The Yardmax only works with the Yardmax collar. Now, the positives are too many to list. I really don't know why more people don't setup their own fences like this. It is really an easy task, and training is more fun than it is a chore. Now, I don't really have to worry about Gimo running out to get hit by a car or anything. He gets his play time, and everyone is happy. This system is a very good investment and I'm glad I contacted the people at Flexpetz to help with this selection. I am really satisfied with my purchase of the YardMax dog fence system. I bought this dog fence from this company and I am glad that I did. One of the most important aspects is they have excellent customer support. I had a couple questions during installation and they were answered by the helpful staff at FlexPetz. After installation life has been 10 times easier. My dog now can take full advantage of the entire yard. I highly recommend this system. The YardMax mode allows my dog more exercise. He is considered a family member. This system is well worth the expense. The YardMax fence Pro Grade is a top quality PetSafe product with a unique function. I was taken aback by the cost of the YardMax fence, as compared to the other systems that PetSafe has to offer. I contacted Flexpetz to see what the hubub was about and learned about the unique way that the YardMax will send a shock to the dog no matter how far she runs out of the enclosed area. I really like this feature and have found it to be well worth the money. I originally thought that wireless would be the way to go, but was told that it would not be very reliable under a metal roof. The YardMax fence is priced on the high side for the fence systems, but it can do what no other fence can do. I give this YardMax fence the two thumbs up seal of approval. I bought one system for my home in Asbury Park, NJ during the summer of last year. We have a vacation home down here in Florida and after experiencing the great outcome of how the system worked up north, I decided to buy one for down here. I installed my second fence about a week ago and I have had no issues with the one up north or this one. I did not know how well it would work by burying the wire, but it was not hard at all down here with the crab grass. I would recommend this fence to anyone looking to confine their dog to specific areas. Works great! The YardMax was great investment. I did some research to locate the best value dog fence out there. I came across the FlexPetz website and after some research decided to go with the YardMax system that is on the site. The system was easy to install. I would recommend this system for dog owners looking for an awesome dog fence system. I had questions about the system and received great instruction from the support at FlexPetz. The investment that I made was a good one. Two thumbs up for the YardMax system. Very happy with this fence. I did not want to put a physical fence in my yard and cover all my land work I have done. I am used to doing outdoors work, so the set up was really not a hard project. I was impressed with the quality of the wire in this package and the smaller packages did not have the stranded wire that comes with this one. The collar fits wonderfully one my beauty and it is not as ugly as I pictured. My yard still looks great because i only cut down the grass and stapled the wire into the ground where I wanted it. Currently, 3 weeks later, the grass has grown over nicely and you cant notice let alone really find the wire if it weren't for the flags that I think is almost time to remove. She knows the boundary pretty well now and the system works perfectly. Before I was constantly calling her back over into the yard as she wandered while I was outside working on the yard work, but now she stays right within the area I would like her to be in but still has all the freedom to the back yard without going so far into the back neighbors yard. i am very happy with this and yes I would recommend it to all that have a medium sized dog. I liked the modes on the transmitter itself but took me a while to think of which worked best. I like the fact that the collar charges and can easily be removed and placed back on without issues. Excellent Fence. The YardMax is perfect for containing a corgi. Very pleased. I never knew much about the static fences until I spoke with the staff at Flexpetz. They really helped me understand the differences in the varied systems that are out there. Because of my living situation, I couldn't find a better system for me than the YardMax, by PetSafe. It only makes sense to go with the Pro Grade version of it, since it will last at least as long as I'm at my home. I didn't want to worry about fixing degraded wire and the supreme wire in the Pro Grade kit will last and last. I'm in longer than a month with my YardMax experience and am very happy with what I see so far. I would surely recommend this system to friends. I just spent a good deal of time going over some training on this system, with the Flexpetz staff last week. Once everything came out of the box, it looked a bit overwhelming, and I'm not the best with printed instructions. The professionals at Flexpetz were very attentive and went at my pace. I learned a lot and feel much more confident with this fence now. I'm really glad I picked it up and hope to realize many many years of solid service from it. I'm surely going to go back to Flexpetz for any other pet necessities. Yardmax is worth every penny. The Yardmax electric fence is pretty expensive, compared to the other fences that Flexpetz sells. However, it's well worth the expense. And the pro grade version is the way to go. I feel like if I make an investment on something like this, -I want to make sure it lasts a long time, and with the thick "extreme" wire, I know it will. The system is now installed, and training was over last week. As of now, it's working like the Flexpetz guy said it would. I think his name is David or something. He spoke about how the fence would send out the static shock, and he was right on. I didn't think I would spend so much on the fence system, but I made the right choice for sure. This Yardmax system is fantastic. I thought for many days to come and write a review and I think this would be good for people to hear. I bought this fence from this company and actually spent what felt half the day on the phone with Johnny one of the sales techs. He explained the system and how it works and what I basically need to do when it arrives. He pulled me through this site and helped me plan out the rout I took with the wire and everything. He asked me valuable questions and made me laugh a lot. Made things a lot easier as time went on. There are pages on this site that has become very helpful to me and I can not find anything like this online anywhere else. Very supportive and helpful information. I wish they had sites like this for every do it yourself project I have done, would have cut a lot of time. I got the system in and the installation was a lot easier then I thought. The wire was very think, thicker then I really thought. I did mine with staples above ground on top of the short cut grass I cut and ran it under the driveway. Within a couple of days the wire was gone, not gone, just hidden. The whole process was extremely easy and I will be coming back to this site much. I also will be ordering a couple of the collars my wife has picked out on here. The system works great and our dog was very easy to train. My son ended up buying the same system as well for their dog and I left the flags up because they come over all the time. Now the dogs can play around in the yard with no worries. Dude, this YardMax wire fence frickin rocks. This thing is awesome. One thing I can say is that if you thing this Yardmax is overpriced, think again. This system is the bomb. Best thing to keep a sneaky lhasa from making a break for it. It was a little tricky to setup at first, because of the cable wire in the yard, but a few adjustments and BOOM, fenceage. I accidentally set the collar to high to start and it scared the dooky out of Lil Momo. Sorry Mo. Got it on level 2 and that does the job. I'd get this thing again and again. Can I add a bigger dog to the fence? The YardMax Pro Grade Dog Fence Is High Quality And In A Class All Its Own. This fence package is in a category that sets itself apart from most of the other wire shock fences that are available, especially in a kit that the end user/customer can setup and configure themselves. I'm a hands on type of person and don't like the idea of having someone come out and setup a product that I can be capable of setting up myself. Aside from that, the cost of having someone come setup this type of fence system is outrageous. I contacted a few places both online and pet stores. It seems that the best bargains I found ended up being with Flexpetz. The staff there are patient and knowledgeable and answered all the questions I had about how these systems work. I ended up very pleased with what I got and would highly recommend the YardMax Pro Grade Fence to anyone. Flexpetz is definitely the company to go with, whether you're a novice or skilled customer. This is tons better than the Guardian system. YardMax is way better already. Just another perfect example of a lesson learned in "you get what you pay for". While this YardMax Pro Grade fence is relatively inexpensive as compared to the Invisible Fences that you have the companies come out and install for you, it is still a big investment. I learned, in trying to go cheap (with the Guardian fence), that cheaper is not always better. When this YardMax is installed, it's the greatest thing since sliced bread. There's not running through the zapping area and being clear on the other side. The zapping area is everywhere except inside the wired area. I love that. I'm now considering adding some of the indoor barriers, to make sure no dogs get on the furniture. I think they're compatible. What an amazing product! I live Chicago, but was recently transferred to a branch of our company located in the country. I was deeply worried about the move as my wife's beloved Kaninchen Dachshund, Max, wasn't used to the country and its wide open spaces. Shortly after moving in, we became mortified, as our dog would constantly run after cars on a nearby busy stretch of road. We attempted to keep the dog inside, only to have him constantly barking at all hours of the day. He refused to eat and seemed quite depressed at the thought of no longer being able to go outside The situation got so bad that my wife was in tears and even contemplated giving her beloved dog away. Not wanting to tear the two apart, I vowed to find a solution to the situation. After several hours of internet research, I decided that a dog fence system was the best way to resolve the situation. I called up a professional company and they arrived and completed a consultation on my property. I was shocked to find out that my rather large backyard would cost several thousands of dollars to professional fence. There was no way I was going to spend this without getting a second opinion, so I headed to the vet who instead suggested D.I.Y. Pet Fence. I found the price to be much more acceptable and ordered it right away. After 6 hours on a Saturday afternoon I managed to have the whole system installed and up and running. The 1000 feet I ordered was more than enough to fence my whole backyard and the heavy duty ground staples really insured that the wire was nice and secure in the soil. The dog is now free to roam are large backyard and gets all his energy out running around four to five hours during the day. My wife especially loves indoor zones which allow her to keep Miley away from the trash cans. The PetSafe YardMax collar is also great as it's small and lightweight and perfect for our 12 pound dog, allowing him to do all the things he usually does without any discomfort. The fit feature also ensures that the collar is fitted properly and doesn't unnecessarily hurt our dog or reduced the usefulness of the fence. I can't say how much of a difference the YardMax system has made in our lives. From being cooped up inside tearing the house or to freely running outside and being his normal. Wonderful product, we really love it. I am the loving owner of a Bull Terrier named Terry. Terry is a very boisterous dog and we have had problems keeping him under control. I have never felt comfortable letting him roam in the back yard as he likes to go beyond our garden, causing problems with the neighbors. We decided to upgrade our fencing but we were priced out by the very expensive installation costs, we simply couldn't afford to spend over 1000 dollars for the fence to be installed. We discovered Flexpetz after further research online. My husband discussed our situation with a very helpful member of staff. We decided to purchase the PRO-Grade dog fence and it has proven to be an excellent decision. The PRO-grade kit is heavy duty, the staples and wire are substantial and durable, it is clearly built to last. Installing the fence was easy and it saved us a lot of money. The correction is a sufficient deterrent for Terry and it didn't take long for him to learn to not go beyond the fence, dogs are not stupid and he didn't require much training to become accustomed to his new surroundings. The collar didn't cause him any problems either. I finally feel comfortable letting Terry roam around, safe in the knowledge that our new fence will keep him within our boundaries. I feel assured knowing Terry is safe and our neighbors will not be pestered.